There are so many things we never think about, taking it for granted, for instance, that when it's rainy or snowy our windshield wipers will keep the windshield sufficiently clean for us to keep motoring. But windshield wipers weren't always a given. Early vehicles didn't have them. After all, if a horse-drawn carriage didn't need them, why did a horseless one? Well, because a driver needed some protection from those gal-darned gnats, for one, and because a driver who got up some speed needed a windbreak, and because new-fangled drivers really did need to see where they were pointing their cars. Besides, if a horse came upon an immovable object, it'd usually stop contrary to the drivers wishes. Cars didn't provide this second opinion. Early drivers were pretty resourceful when it came to keeping their cars running. In lieu of the yet-to-be-invented windshield wiper, they are said to have used plug tobacco, a piece of potato, carrot or onion, or most anything else they could remember to bring along to keep their small piece of vertical glass wiped down during inclement weather. I'm thinking some of them must have tried rags or sponges, too, before squeegees (available for less than a dollar) became the tool of choice. The first known inventor of an actual windshield wiper was Irish-born inventor J. H. Apjohn, who, in 1903, developed a UK-patented method of moving two brushes top to bottom to clear the windshield. As so often happens, however, another inventor was working on a solution about the same time and is credited with the first American wipers and the first operational windshield wiper. Mary Anderson was her name and she hailed from Alabama. On a visit to New York City in 1902 she watched a trolley car driver struggle to keep his windshield clear during a sleet storm. The driver could leave the glass down and get cold and drenched or stop the car to clear the glass. Either way riders weren't happy with the results. So Mary came up with a swinging arm fitted with a rubber blade that the driver could operate via inside lever. A spindle passed through a hole in the frame of the windshield, connecting the external rubber wiping blade and the interior handle. A counterweight and spring held the external blade to the glass. Her ingenious invention pre-dated the Model T and cars weren't yet so popular. Many of the cars being produced did not yet have windshields and drivers could just leave their cars covered up until the storm passed. By 1916, however, her invention was available in all U.S.-made vehicles. In 1917 Charlotte Bridgewood invented and patented the first automatic windshield wiper, one that was roller-based and dubbed the "Storm Windshield Cleaner". The product was not a commercial success, however. Most drivers still had to steer and shift with one hand while operating the wipers with the other. Realizing the inherent danger in this practice, other inventors came up with motorized solutions, e.g., a one-armed blade installed in the top center of the windshield (an invention of Hawaiian dentist Dr. Ormand Wall) or double blades, the outside rubber and the inside felt-lined squeegees. Manually operated windshield wiper on a 1920 Kissel Gold Bug. Photo courtesy of www.HymanLtd.com. Following a collision one rainy night in 1917 between a National Roadster and bicyclist in Buffalo, New York, J.R. Oishei, the car's shaken driver, sought a way to keep windshields clear. He found a retired electrical engineer, John W. Jepson, who had invented a hand-operated squeegee known as "Rain Rubber". Put away in the car's tool box during fair weather, a driver took it out for foul weather, sticking its handle through the opening between the upper and lower sections of the two-part windshield. As the driver pushed the handle back and forth, the blade cleared the windshield. Oishei patented the device and in 1920 Tri-Continental Corporation (later known as Trico) was incorporated to manufacture it. In 1921, American inventor William Folberth patented a vacuum-powered, single blade wiper run by suction from the engine's intake manifold. Timing was a bit of a problem in that wiper speed matched that of the car. With the throttle wide open, the engine vacuum dropped and wipers either slowed down or stopped altogether. Nonetheless, Trico, now a major name in wipers, bought Folberth's company in 1925 for $1 million and his inexpensive vacuum system saw widespread and unchanged use for many years. 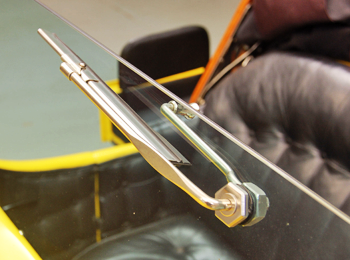 On cars built prior to 1920 most wipers were paired and anchored at the top of the windshield. Cadillac introduced vacuum-driven wipers in the 20s and other manufacturers soon followed suit. Henry Ford, notoriously stubborn about adding any new "gadgets" to cars, saw the light after a Trico salesman installed a manual wiper on Ford's own car. As electrical systems evolved, wipers were relocated to the base of the windshield. By the mid-thirties Trico had introduced the first windshield-washer system and by the late forties the first combination wiper/washer system. Eventually windshield washers were commonplace, requiring spray nozzles in front of the windshield and a reservoir for washer fluid located under the hood. Typically they were operated by an electrical pump. In the late 1950s another novelty was introduced whereby a driver could push the washer button and activate the wipers for a few swipes across the windshield. Nowadays that's accomplished by means of an electronic timer but then a small cylinder connected to a switch provided the delay as the vacuum leaked off. The next major improvement in wipers came with a David and Goliath-type story, at least according to the David in the story. Robert Kearns, an engineering professor, after noticing that the human eye blinked only every few seconds rather than continuously, began tinkering with the idea of intermittent power wipers. Eventually he installed a prototype of them on his '62 Ford Galaxie. In 1963 he demonstrated the system to Ford, hoping they would license his technology (patented in 1967 and utilizing a solid-state circuit) that enabled drivers to select one of several delays between two consecutive swipes. Instead, they came out with their own version of intermittent wipers in 1969, a decision that frustrated Kearns and led him to file a patent infringement suit against them and other car manufacturers who followed their lead. As the 2008 film "Flash of Genius" detailed, after many years of litigation and the hiring and firing of numerous law firms, federal juries assessed Ford damages of a little more than $10 million for unintentional patent infringement and Chrysler roughly $19 million in damages. Suits filed against other automakers were, however, dismissed, after Kearns, by then proceeding on his own, missed multiple filing deadlines. 1970 found Saab introducing headlight wipers and Citroen bringing out rain-sensitive intermittent wipers. How did those wipers "know" when to wipe? The engine measured the resistance wipers met on the first swipe; slight resistance meant the windshield was relatively dry while greater resistance indicated more moisture. In the 1990s, infrared optical micro sensors built into windshields could sense rain and determine wiper speed. Cadillac introduced these sensor wipers in 1996 but they're now available on many other makes and models. The earliest wiper technology, while relatively primitive, upped vehicle safety considerably. With the passage of time and the further development of electronic gadgetry, wipers appeared on front and rear windshields and also on headlights. From the days when drivers had to remember to bring a squeegee along or fish in their toolkit to find their purpose-made squeegee, we now have windshields with built-in sensors that don't require us even to hit a button to have clear windshields. Now we can just take it for granted that wipers, no longer optional equipment, will be there when we need them.